Savitri had to drop out of school after 8th grade because her family could not afford to send her to school. Due to dire poverty, they could now make ends meet and so her childhood was reduced to doing household chores. The Swarachna Learning and Resource Centre met and convinced her parents to send her back to school. Savitri was re-enrolled in a school. Due to her family's condition, she was enrolled in the mid-day meal program. With regular nutrition, she began to get stronger. She is a good at studies and a good singer. She is always amongst the top five students in her class and loves to participate in sports. Every child deserves a healthy meal, you can help children from going hungry. This program is done in 13 villages in Sitapur, Uttar Pradesh. During a school health check-up, it was noticed that 95% of the children were malnourished.Most of the children belonged to poor Dalit families and carried leftovers for lunch which is normally a chapatti with pickle or sugar. No education is possible on a hungry stomach and hence a mid-day meal program was introduced. This program provides the children studying at the Swarachna Learning and Resource Centre a complete meal as part of their routine during the school day. The center prepares a nutritionally balanced meal for over 300 children on all working days in a year. The kitchen and other resources required for preparing the meal are provided by the center. Mothers of the students are employed to cook which ensures the quality of the meal. Donate to this program and help two children get access to a mid-day meal. 'Swarachna Learning and Resource Centre', besides providing education, acts as a creative learning space for the children, introducing them to the larger world, by means of books, magazines, critically selected movies as well as documentaries and then encourages discussions, debates and exploration of these new ideas. In 2017, Swarachna School delivered 100% pass result in both 10th and 12th Grade. 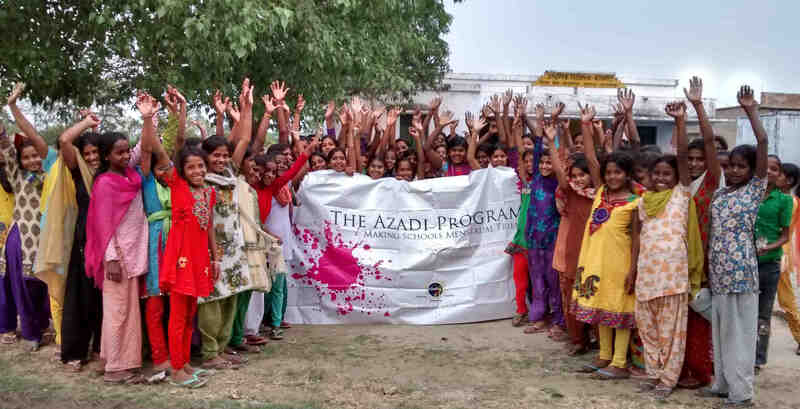 By April 2019, we will start the first batch of 40 girls selected through an entrance exams conducted in KGBV Sitapur, Uttar Pradesh. By April 2022, Milaan will expand the Swarachna School and aims to work with 1000 children from current strength of 406 children. We also aim at developing a residential facility for 200 academically high performing girls from low-income communities to pursue their secondary and senior secondary education (Grade 9th to 12th). One of our students Shikha Yadav belongs to a poor Dalit family. She is studying in 5th standard and she enjoys dancing. Her family income is INR 40,000 per annum. She has a keen interest in craft work, especially coloring books. It was observed by her class teacher that she did not carry lunch to school which affected her growth and performance. After a while she lacked the motivation to remain focused. During a regular school health check up, it was noticed that Shikha like majority of children was malnourished. With the introduction of mid day meal program at the centre and regular nutrition, Shikha started to become stronger and her grades improved. She is now always amongst the top five students in her class and loves to participate in Art competitions. Every Monday we serve Rice, Dal and Vegetables; Tuesday we serve Rice and Vegetables; Wednesday we serve Chola-Rice; Thursday we serve Mix Dal and Rice; Friday we serve Tehri (rice cooked with soyabean chunks and vegetables) and salad and Saturday we serve Poori-Sabji which is her favorite. We as an organisation believe every child deserves a healthy meal. With your continued support, our children will grow healthier every day. The Swarachna School by Milaan operates in a remote and a rural village named Kaintain in Sitapur, UP where education and the needs of 400+ children are taken care of. The Mid-day Meal Program has made a significant impact on the students. It has not only increased the attendance of the students but also to their performance. The incentive of a nutritious and tasty meal brings back the students to school on a daily basis leading to improvement in their learning skills and levels with a consistent attendance. Computer labs, a library, and an innovation lab have been built to provide a platform to disadvantaged children and youth to develop their abilities, skills and to explore their capabilities. In the previous exams, 60 % students from class 10th and 60% students from class 12th passed with distinction. The school celebrated the Annual sports day with exemplary participation by students showcasing the spirit of sportsmanship with healthy competitions covering a wide range of sports like cricket, volleyball, badminton and Kabbadi. A program was initiated for adolescent girls to create awareness and understanding of menstrual hygiene. The initiative also understands and enables the interpersonal, societal and environmental factors to empower adolescent girls.